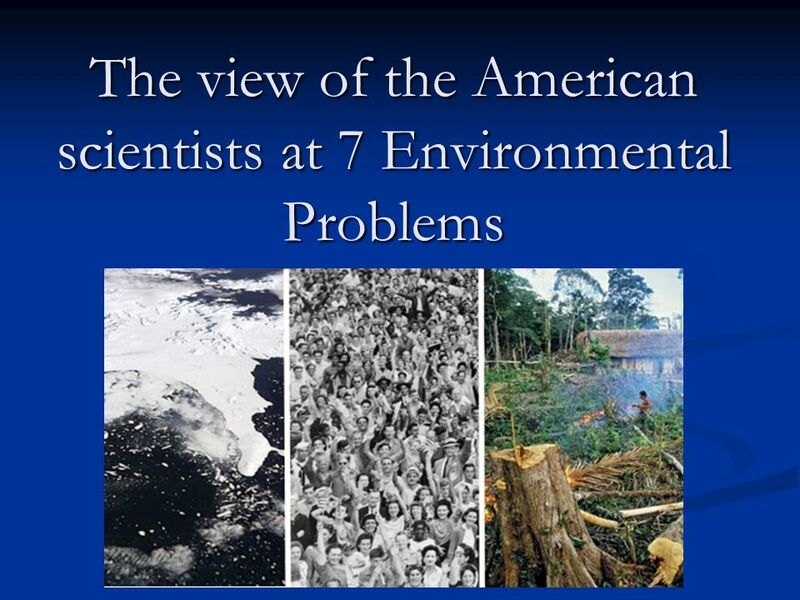 The view of the American scientists at 7 Environmental Problems. 3 In reality, the problems are worse than we thought! With as much attention as the environment has been getting lately, youd think that wed be further along in our fight to preserve the worlds species, resources and the beautiful diversity of nature. Unfortunately, things arent nearly that rosy. 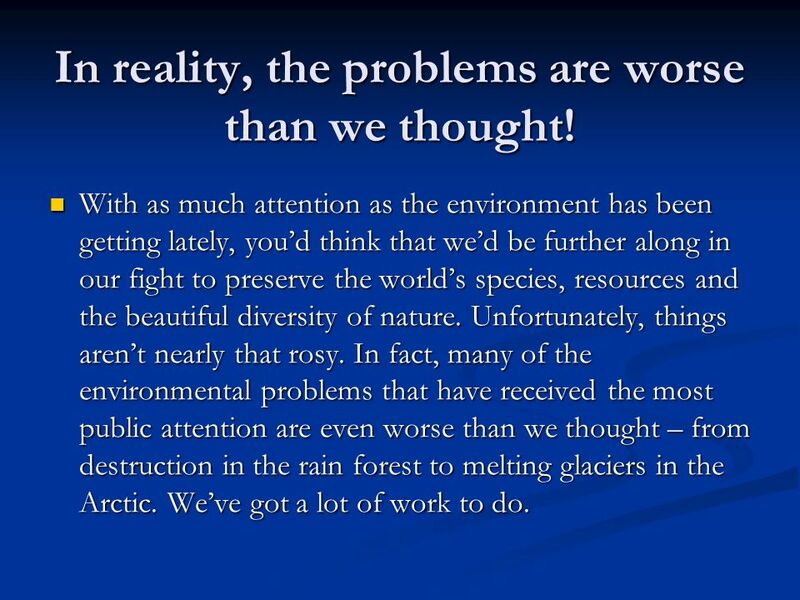 In fact, many of the environmental problems that have received the most public attention are even worse than we thought – from destruction in the rain forest to melting glaciers in the Arctic. Weve got a lot of work to do. With as much attention as the environment has been getting lately, youd think that wed be further along in our fight to preserve the worlds species, resources and the beautiful diversity of nature. Unfortunately, things arent nearly that rosy. In fact, many of the environmental problems that have received the most public attention are even worse than we thought – from destruction in the rain forest to melting glaciers in the Arctic. Weve got a lot of work to do. 5 6. The Ocean Dead Zones In oceans around the world, there are eerie areas that are devoid of nearly all life. These dead zones a lack of oxygen excess nitrogen from farm fertilizers, emissions from vehicles and factories, and sewage. The number of dead zones has been growing fast – since the 1960s, the number of dead zones has doubled every 10 years. They range in size from under a square mile to 45,000 square miles, and the most infamous one of all is in the Gulf of Mexico, a product of toxic sludge that flows down the Mississippi from farms in the Midwest. These hypoxic zones now cover an area roughly the size of Oregon. 6 5. 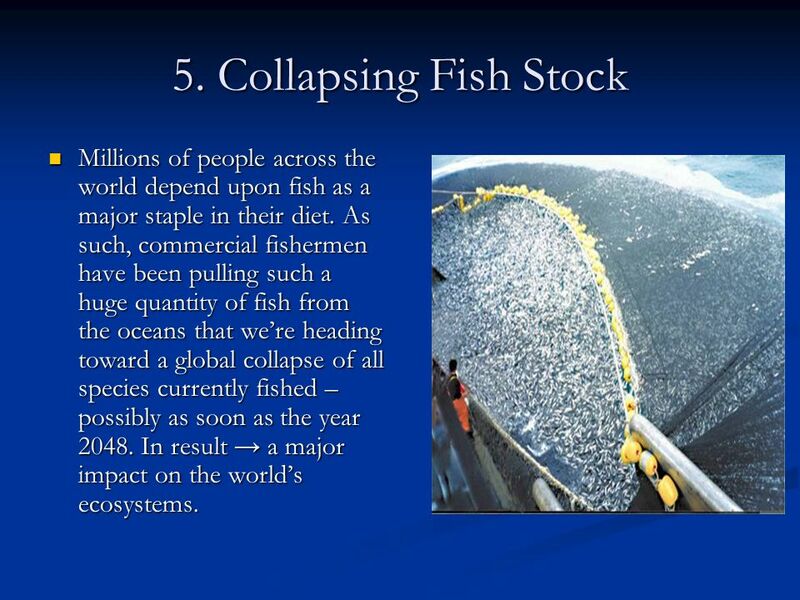 Collapsing Fish Stock Millions of people across the world depend upon fish as a major staple in their diet. As such, commercial fishermen have been pulling such a huge quantity of fish from the oceans that were heading toward a global collapse of all species currently fished – possibly as soon as the year 2048. In result a major impact on the worlds ecosystems. Millions of people across the world depend upon fish as a major staple in their diet. As such, commercial fishermen have been pulling such a huge quantity of fish from the oceans that were heading toward a global collapse of all species currently fished – possibly as soon as the year 2048. In result a major impact on the worlds ecosystems. 8 3. Polar Sea Ice Loss Polar sea ice is melting at an unprecedented rate visual evidence of global warming Polar sea ice is melting at an unprecedented rate visual evidence of global warming its got scientists rushing to figure out just how big of an effect the melting is going to have on the rest of the world. its got scientists rushing to figure out just how big of an effect the melting is going to have on the rest of the world. 10 1. 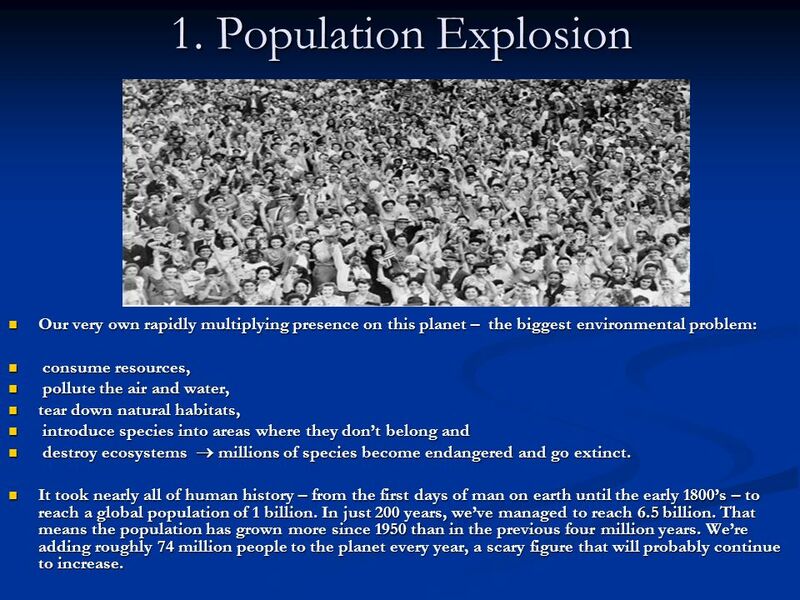 Population Explosion Our very own rapidly multiplying presence on this planet – the biggest environmental problem: consume resources, pollute the air and water, tear down natural habitats, introduce species into areas where they dont belong and destroy ecosystems millions of species become endangered and go extinct. It took nearly all of human history – from the first days of man on earth until the early 1800s – to reach a global population of 1 billion. In just 200 years, weve managed to reach 6.5 billion. That means the population has grown more since 1950 than in the previous four million years. Were adding roughly 74 million people to the planet every year, a scary figure that will probably continue to increase. 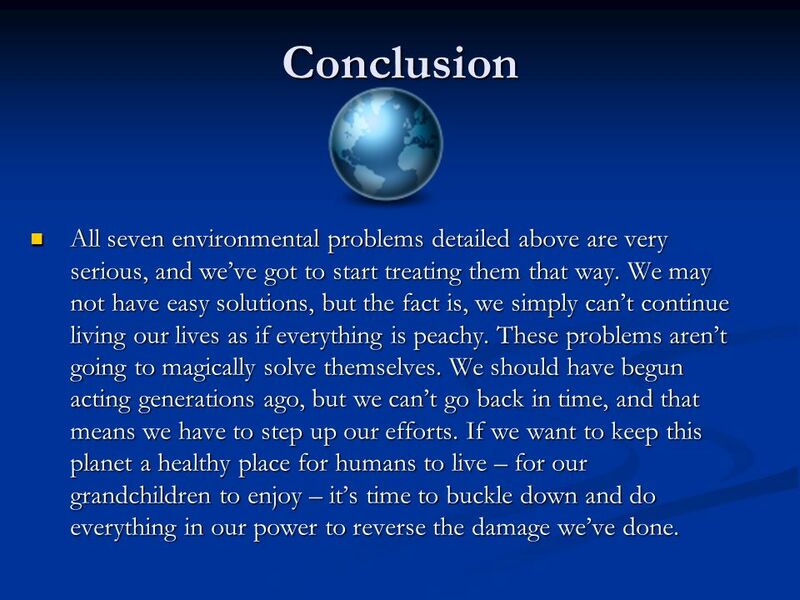 11 Conclusion All seven environmental problems detailed above are very serious, and weve got to start treating them that way. We may not have easy solutions, but the fact is, we simply cant continue living our lives as if everything is peachy. These problems arent going to magically solve themselves. We should have begun acting generations ago, but we cant go back in time, and that means we have to step up our efforts. If we want to keep this planet a healthy place for humans to live – for our grandchildren to enjoy – its time to buckle down and do everything in our power to reverse the damage weve done. 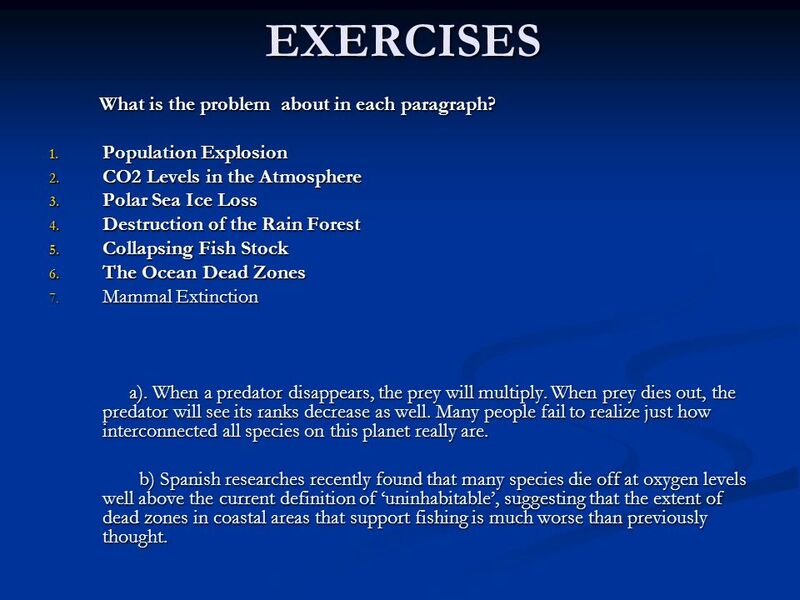 All seven environmental problems detailed above are very serious, and weve got to start treating them that way. We may not have easy solutions, but the fact is, we simply cant continue living our lives as if everything is peachy. These problems arent going to magically solve themselves. We should have begun acting generations ago, but we cant go back in time, and that means we have to step up our efforts. If we want to keep this planet a healthy place for humans to live – for our grandchildren to enjoy – its time to buckle down and do everything in our power to reverse the damage weve done. 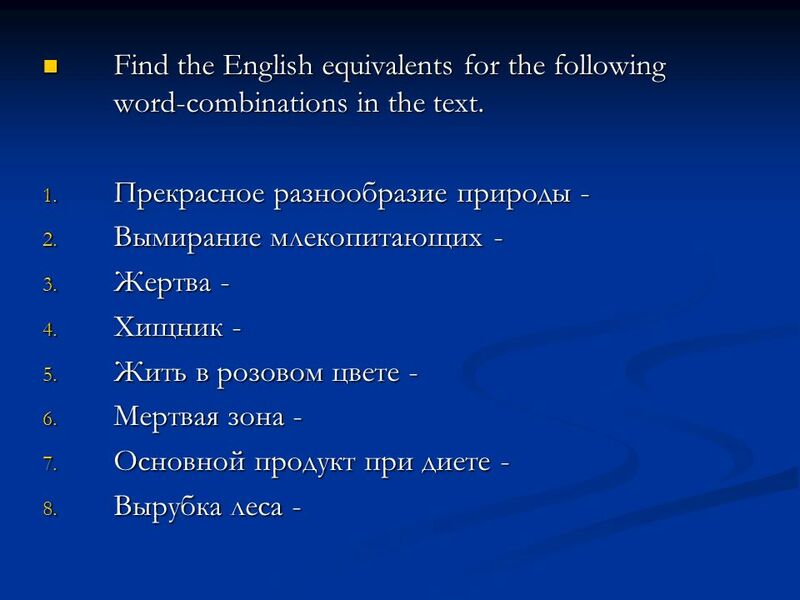 12 EXERCISES What is the problem about in each paragraph? What is the problem about in each paragraph? 1. Population Explosion 2. 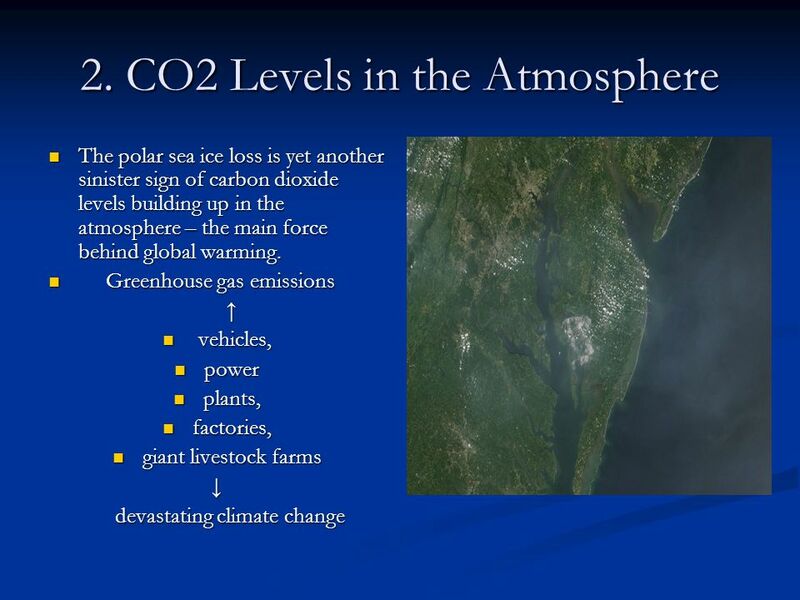 CO2 Levels in the Atmosphere 3. 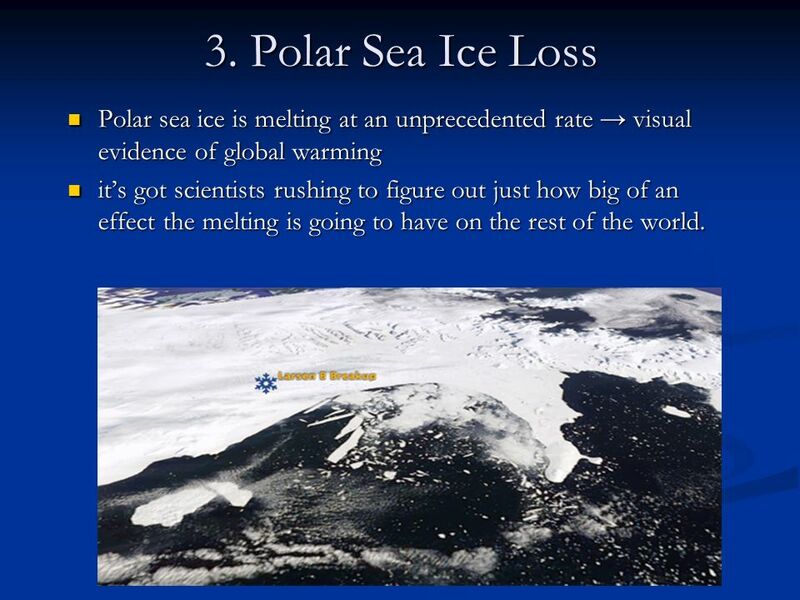 Polar Sea Ice Loss 4. 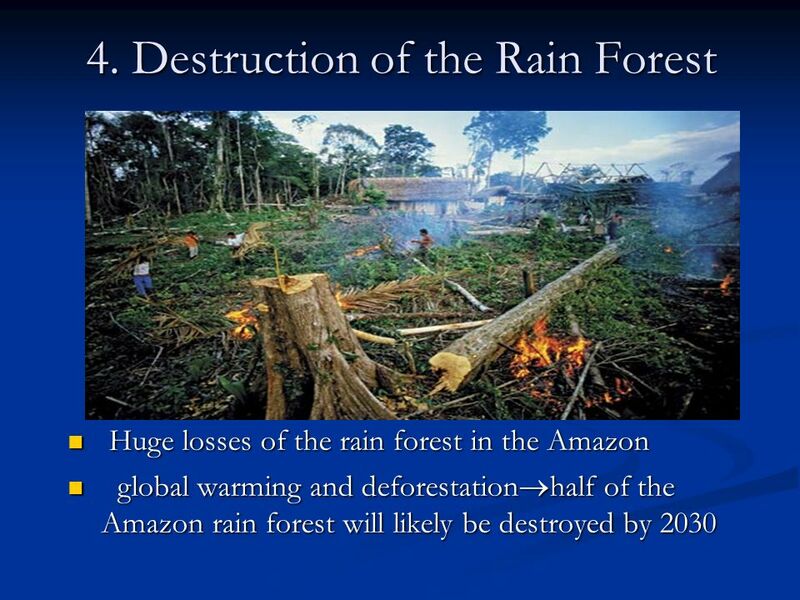 Destruction of the Rain Forest 5. Collapsing Fish Stock 6. 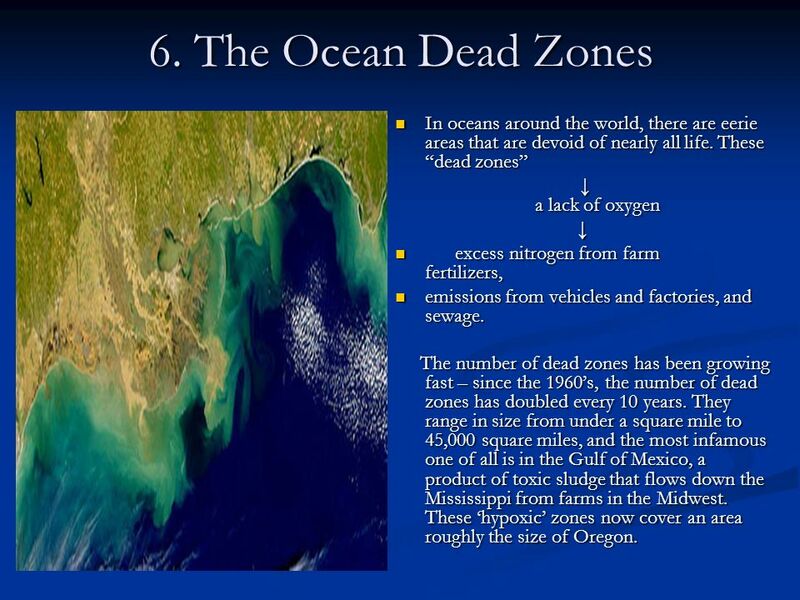 The Ocean Dead Zones 7. 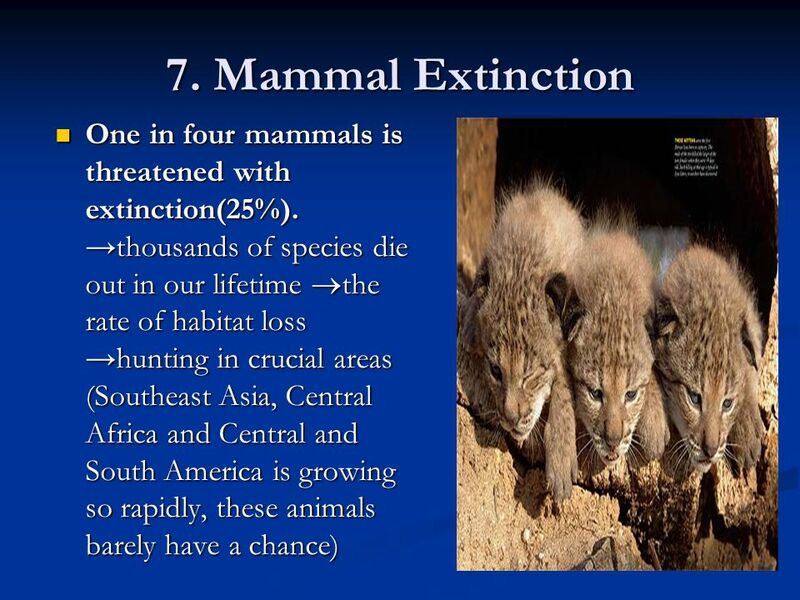 Mammal Extinction a). When a predator disappears, the prey will multiply. When prey dies out, the predator will see its ranks decrease as well. Many people fail to realize just how interconnected all species on this planet really are. a). When a predator disappears, the prey will multiply. When prey dies out, the predator will see its ranks decrease as well. Many people fail to realize just how interconnected all species on this planet really are. b) Spanish researches recently found that many species die off at oxygen levels well above the current definition of uninhabitable, suggesting that the extent of dead zones in coastal areas that support fishing is much worse than previously thought. b) Spanish researches recently found that many species die off at oxygen levels well above the current definition of uninhabitable, suggesting that the extent of dead zones in coastal areas that support fishing is much worse than previously thought. 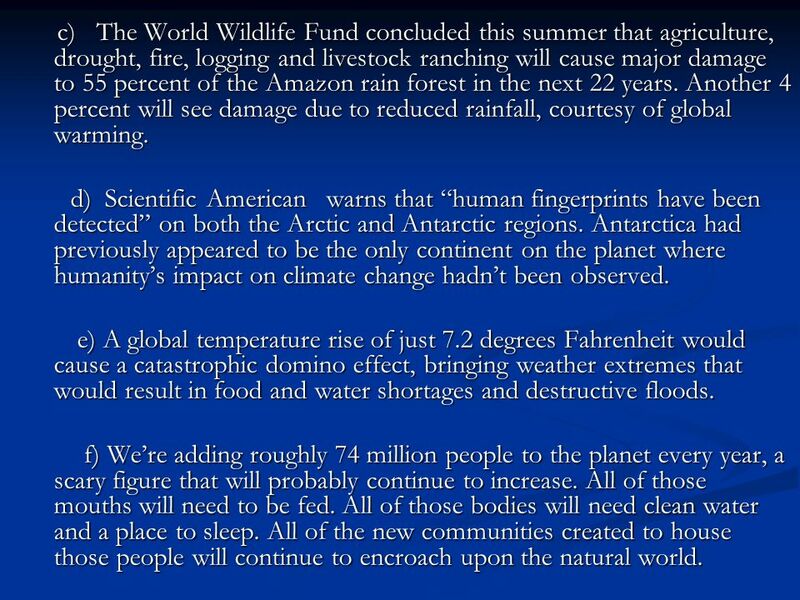 13 c) The World Wildlife Fund concluded this summer that agriculture, drought, fire, logging and livestock ranching will cause major damage to 55 percent of the Amazon rain forest in the next 22 years. Another 4 percent will see damage due to reduced rainfall, courtesy of global warming. c) The World Wildlife Fund concluded this summer that agriculture, drought, fire, logging and livestock ranching will cause major damage to 55 percent of the Amazon rain forest in the next 22 years. Another 4 percent will see damage due to reduced rainfall, courtesy of global warming. d) Scientific American warns that human fingerprints have been detected on both the Arctic and Antarctic regions. Antarctica had previously appeared to be the only continent on the planet where humanitys impact on climate change hadnt been observed. d) Scientific American warns that human fingerprints have been detected on both the Arctic and Antarctic regions. Antarctica had previously appeared to be the only continent on the planet where humanitys impact on climate change hadnt been observed. 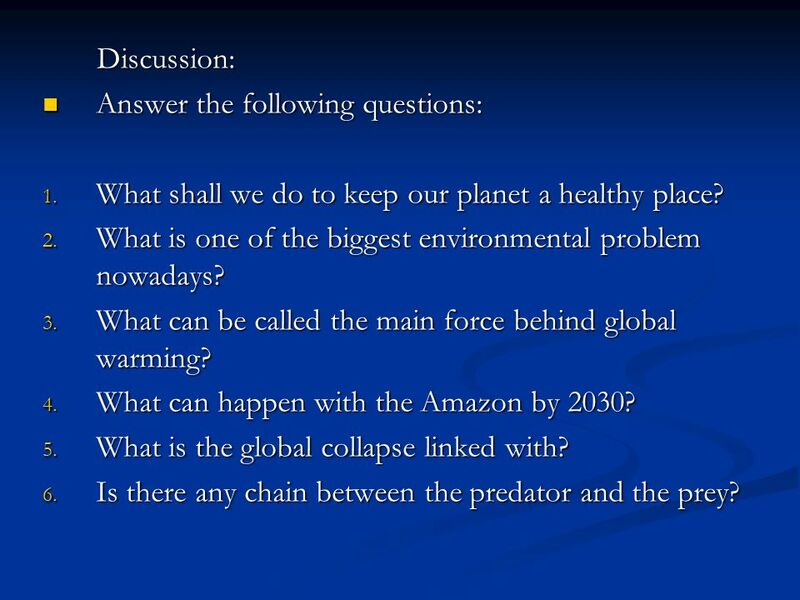 e) A global temperature rise of just 7.2 degrees Fahrenheit would cause a catastrophic domino effect, bringing weather extremes that would result in food and water shortages and destructive floods. e) A global temperature rise of just 7.2 degrees Fahrenheit would cause a catastrophic domino effect, bringing weather extremes that would result in food and water shortages and destructive floods. f) Were adding roughly 74 million people to the planet every year, a scary figure that will probably continue to increase. All of those mouths will need to be fed. All of those bodies will need clean water and a place to sleep. All of the new communities created to house those people will continue to encroach upon the natural world. f) Were adding roughly 74 million people to the planet every year, a scary figure that will probably continue to increase. All of those mouths will need to be fed. All of those bodies will need clean water and a place to sleep. All of the new communities created to house those people will continue to encroach upon the natural world. 14 Discussion: Discussion: Answer the following questions: Answer the following questions: 1. What shall we do to keep our planet a healthy place? 2. What is one of the biggest environmental problem nowadays? 3. What can be called the main force behind global warming? 4. What can happen with the Amazon by 2030? 5. What is the global collapse linked with? 6. Is there any chain between the predator and the prey? 16 Keys to the exercises I. 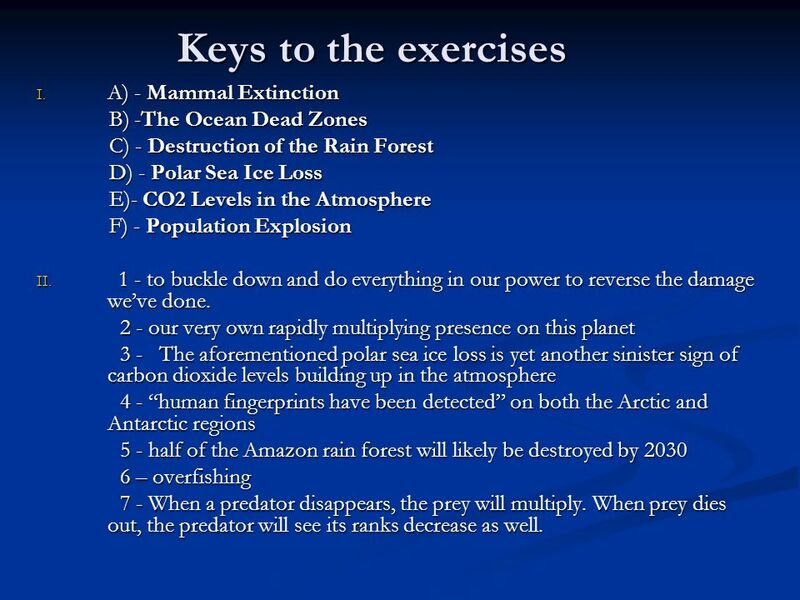 A) - Mammal Extinction B) -The Ocean Dead Zones B) -The Ocean Dead Zones C) - Destruction of the Rain Forest C) - Destruction of the Rain Forest D) - Polar Sea Ice Loss D) - Polar Sea Ice Loss E)- CO2 Levels in the Atmosphere E)- CO2 Levels in the Atmosphere F) - Population Explosion F) - Population Explosion II. 1 - to buckle down and do everything in our power to reverse the damage weve done. 2 - our very own rapidly multiplying presence on this planet 2 - our very own rapidly multiplying presence on this planet 3 - The aforementioned polar sea ice loss is yet another sinister sign of carbon dioxide levels building up in the atmosphere 3 - The aforementioned polar sea ice loss is yet another sinister sign of carbon dioxide levels building up in the atmosphere 4 - human fingerprints have been detected on both the Arctic and Antarctic regions 4 - human fingerprints have been detected on both the Arctic and Antarctic regions 5 - half of the Amazon rain forest will likely be destroyed by 2030 5 - half of the Amazon rain forest will likely be destroyed by 2030 6 – overfishing 6 – overfishing 7 - When a predator disappears, the prey will multiply. When prey dies out, the predator will see its ranks decrease as well. 7 - When a predator disappears, the prey will multiply. When prey dies out, the predator will see its ranks decrease as well. 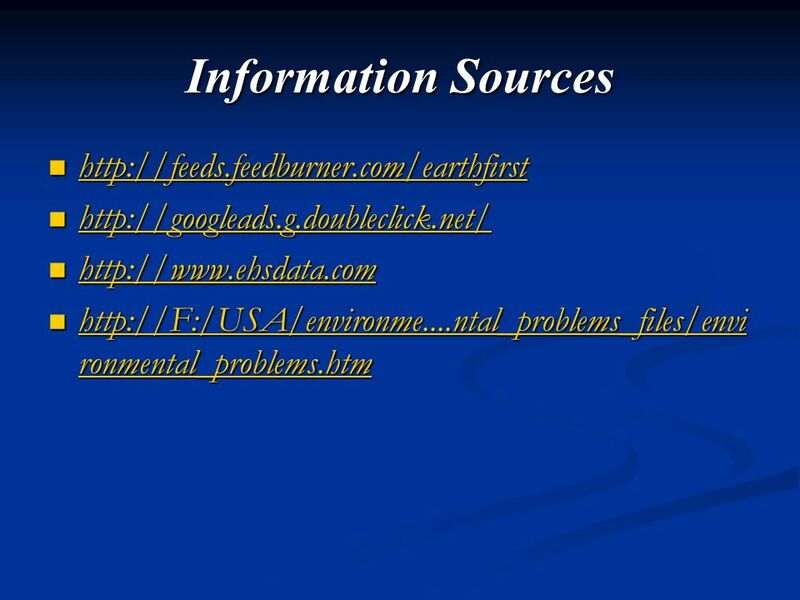 Download ppt "The view of the American scientists at 7 Environmental Problems." Destruction of the rainforest By Cameron Pringle. Slide 1 of 30 Copyright Pearson Prentice Hall 6-4 Charting a Course for the Future. Global Warming By: Austin. What is Global Warming Carbon dioxide. Pollution and Global Warming. The Beginning The Earth was formed 4,6 billion years ago and its temperature has always been changing. But since the 19. Cool Facts About Global Warming Donna Bowman Educational Outreach Coordinator SCDHEC - Bureau of Air Quality. By: Lauren Quinn and Karina Zeferino.  Polar icecaps melting  Natural disasters  Endangered animals  Sea levels rising  Temperatures rising  Water. Throughout the history of the Earth, scientists believe there have been a number of mass extinction events. 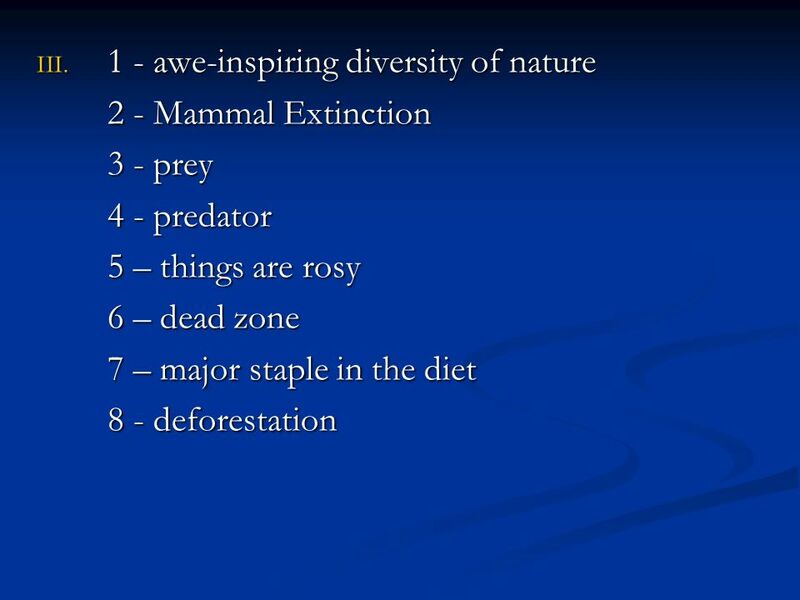 One example of this would be the extinction. 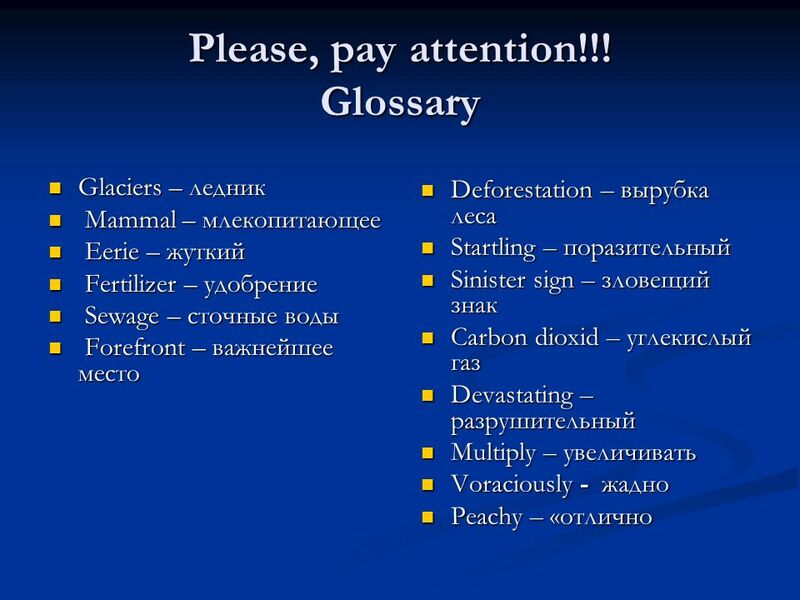 The Basic Science of Climate Change Janina Moretti September 6, 2012. Which of the following things support Global Warming: a) Winters becoming more and more milder b) Drought in the last 3 years c) Melting of the Arctic. North Carolina Objective: Understand How is North Carolina affected by human activity? Catalyst- Objective: Understand How is North Carolina affected by.